With Valentine’s Day tomorrow I thought it only appropriate to give you a bright red recipe in honor of the holiday. And, since you’ve probably been inundated with red velvet and chocolate (ahem, like Friday’s Chocolate Covered Strawberries), I figured I should provide a savory, somewhat healthy counterpoint. Beets are nutritional superstars, boasting high levels of folate, maganese, fiber, vitamin C, betaine, and more. And they taste great. Here they add vibrant color and sweet, earthy flavor to barley risotto – a slightly healthier alternative to traditional arborio rice. Although it takes a little longer than steaming, my favorite way to prepare beets is to roast them as I think it brings out the most flavor. I’m sure you can purchase cooked beets to speed up this risotto, but the roasting time is entirely hands off. The barley gives the dish a pleasantly chewy texture, but you could use half or all arborio rice instead. The inspiration for this recipe came from quite a few sources. 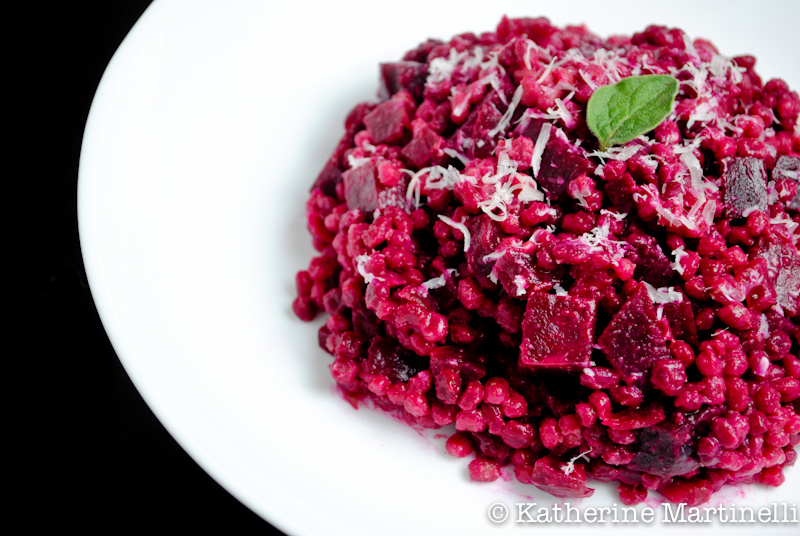 I originally pinned Love and Olive Oil’s gorgeous Roasted Beet Risotto, which she got from Gourmet Live. And Drizzle and Dip’s Beetroot and Barley Risotto gave me the confidence to go ahead and make it with barley instead of arborio rice (I’d already made a Saffron and Butternut Squash Risotto with half and half to great success). In the end I made quite a few adjustments, including using all vegetable broth (instead of water and chicken broth) to make it totally vegetarian. The barley and beets make this a super filling one bowl meal that can easily serve a crowd. For more Valentine’s Day inspiration, I hope you’ll check out my V-Day blog hop from Friday. I was blown away by all the great recipes that people linked up! So much so that I started a whole board on Pinterest just to highlight the recipes. You can check it out here! Happy Valentine’s Day! 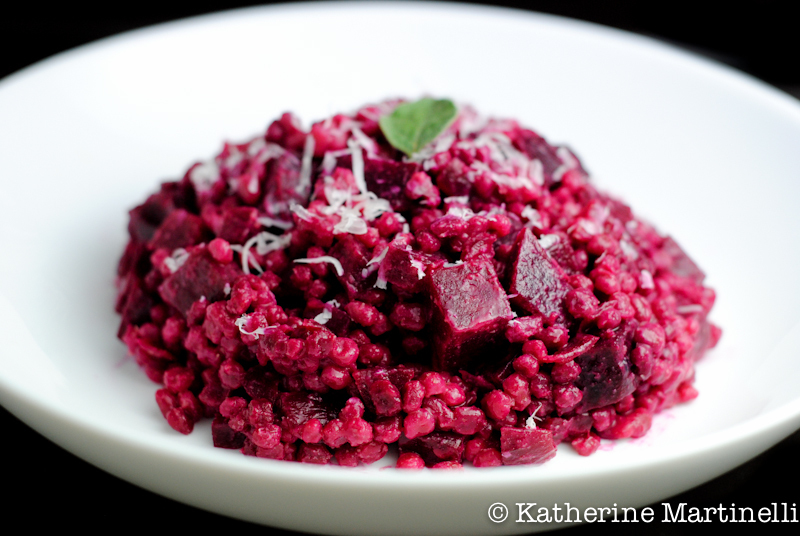 Beetroot lends vibrant color and sweet, earthy flavor to risotto while barley gives the dish a pleasantly chewy texture. Tightly wrap beets in foil and roast on a baking sheet until very tender, about 90 minutes. Remove from the oven and allow to cool, about 20 minutes. When beets are cool enough to handle, peel them, discarding stems and root ends, then cut into ½-inch cubes. Bring the broth to a simmer. Keep at a low simmer, covered (it's important that the broth is hot when making risotto). Melt 2 tablespoons of the butter in a large pan or pot over medium heat. Add the onions and cook, stirring occasionally, until softened but not burnt, about 5 minutes. Add the barley and cook, stirring constantly, 1 minute. Add the wine and simmer briskly, stirring constantly, until absorbed, about 1 minute. Stir in ½ cup broth and simmer briskly, stirring constantly, until broth is absorbed. Continue simmering and adding broth, about ½ cup at a time, stirring constantly and letting each addition be absorbed before adding the next, until barley is just tender and creamy-looking, 25 to 30 minutes. Stir in the beets and season with salt, and pepper (yes, it will turn hot pink!) and cook, stirring, until heated through. Remove from the heat and stir in the remaining 2 tablespoons butter, then the cheese. Taste and season with additional salt and pepper as needed, and serve. Great minds think alike – we both shared a beet recipe! I love your risotto. Pearl barley really is a wonderful alternative to rice. Delicious too! I know! I loooove your beet recipe. And I’ve been on a serious barley kick lately. Thanks so much Jennifer! It really looks Valentine, I love the color. Funny, I just had Risotto for dinner yesterday. This seems to be a fresh an interesting take on one of my favorite dishes — I ought to try it some time. The photos are amazing, as always. That is funny!! Thanks so much Jonathan, I really appreciate your kind comments. Happy Valentine’s Day to you as well! What a wonderful way to bring the spirit of Valentine’s day into a savory dish. Thank you so much Jenny!! I also love beets – they have such incredible flavor, and how can you resist that vibrant color?? I have some beetroot growing in a pot at the moment. I can’t wait to eat them, I think the first thing I will make is this very dish. Who can resist such a vibrant dish! That looks amazing! Happy Valentines to you! This is very creative and beautiful colors. You just gotta love the beets. Happy Valentine’s Day to you. Thanks Suzi! I know, I just love the colors. Happy belated vday! Oooh. This looks so tasty. I love making risotto with barley, healthier and heartier than arborio. What a wonderful Valentine’s Day treat! Me too! I also like to do half arborio and half barley. Thanks Dara! The colors of your risotto is absolutely stunning! What a wonderful idea! I have some beets in the fridge and this is wonderful inspiration! Really creative recipe. I don’t use beets enough in my cooking, which is weird because I like them. Anyway, this sounds and looks spectacular – very pretty dish. Thanks! I know, I’ve only recently started using beets more and am so happy I do since I love them! Oh, I love the sound of this… My husband will not be exactly thrilled, but wow, red beet and barley risotto, what a beautiful looking dish! Haha well, you can always cut the recipe and serve it as a side. It is definitely a very beety dish 🙂 Thanks Sally! Ohhh look at this color, I adore beets! I dont know if I can find pearl barley but eitherway I’ll try it with rice! Your picture does look so vibrant and colorful. I have never had beets and barley together, so I find this to be a very creative dish. Kudos to you posting a festive dish for Valentine’s that is on the healthy side! Red beets really make everything just look so vibrant! I would have never thought about adding them to a risotto, but the colour alone makes it so worth it! I know! Beets are worth using just for their color – the fact that they taste delicious is a bonus. Thanks Tobias! Oooo…such beautiful colour! Looks terrific for this special day. Happy Valentine’s Day to you & your loved ones, Katherine. Hope you’re going to have the most romantic evening. Love beet root…the risotto looks delish and appetizing. This looks so heart healthy meal. I will definitely check your V day blog hop and do check mine which I will post late in the evening. Thanks! It is indeed hearty and healthy – the barley makes it super filling! Ohh – love beets and this looks so tasty!!! Happy V-day! It’s nice to see a savory Valentine’s dish as I’ve seen many sweets for the past few days. Using red beet is a fantastic way to bring in color, and it’s a plus because I love beets! It’s such a beautiful and delicious recipe Katherine. I hope you have/had a good Valentine’s Day! So delicious!!! I have the pearl barley, but I MUST pick up some beets! Yum! What a perfect Valentine’s Day dish! It’s beautiful! I’ve never used barley for risotto but I bet it does add a great texture as well as flavor. Beets – unfortunately, neither of us are big fans of beets even though they are one of the prettiest root vegetables out there and they make a gorgeous risotto. I do have a butternut squash, so maybe I could roast it and use it instead. I love the idea of using the barley and just have to give that a try! Thanks MJ! Yes, if you’re not crazy about beets this definitely isn’t for you. But butternut squash would be amazing! Barley makes a great risotto. I also love to use half barley and half arborio to get the best of both worlds. Wow. That is a seriously colorful dish! I love a savory twist as a contrast to all of the Valentines sweets. So pretty… your recipes just keep getting tastier and tastier! Beets and barley – what a terrific combination and stunning dish! I’m always looking for more ways to use barley. It’s one of my favorite grains by far. Thanks Hannah! I’ve only recently become enamored with barley – it’s so good! This is really beautiful! I am a fan of beets and I like the idea of barley in it….I hope you had a great Valentines Day! Such great color on the risotto! Beets are so great and I love how you incorporated them into a pasta dish. My love for beets is very recent. Your risotto is enticing me with its beautiful colours and the fact that it is made with barley! Bookmarked. Thanks!! I hope you enjoy. I only started liking beets a few years ago and now I just can’t get enough! This was our dinner tonight. Thank you for a great recipe. Thank you for inspiration! I liked the recipe, only I don’t see the need to make the process so tiresome with all baking of beetroots. I have simply peeled and cubed raw beets, then added them to frying onions- cooked a while till just softer but crispy and proceeded as in the recipe… The idea with precooking of beets comes from understanding that introducing raw beets in liquids would make it loose the deep color – by frying them over I avoided it))).